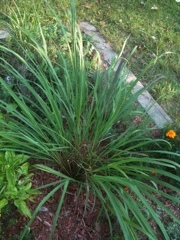 The lemongrass in my herb garden did so well this year, and I had no idea how many uses there for it. I’ve been cutting it up for tea and experimenting with my other herbs: the black mint, lemonbalm, catnip, lavender, chamomile and store bought green tea. This NPR article, Lemongrass Brings Essential Spark To Southeast Asian Cooking , illuminates many traditional uses for lemongrass in Thai cuisine. 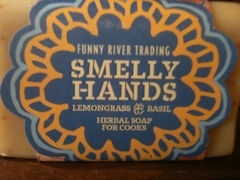 Apparently, lemongrass is also very nice in soaps. I found this delicious smelling bar while shopping in downtown Glens Falls today at the, “Nine Authentic Goods” store.